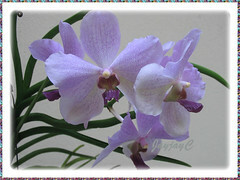 Vandas are gorgeous orchids with a wide range of shades and design, some with beautiful spotted petals. 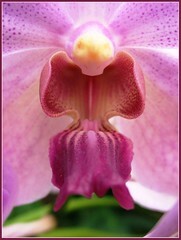 This is the very species of orchids that were held in my palms when I said “I do” in the church so many moons ago! A glorious bouquet of orange spotted vandas with the sweetest memories still as fresh as ever. 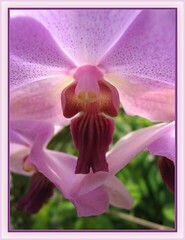 This inspired us to venture on a wonderful journey of growing orchids ever since! Etymology: The genus name, Vanda is derived from the Sanskrit name for the species Vanda roxburghii. 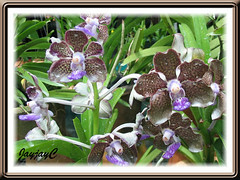 Features: Vanda Orchid belongs to the genus, Vanda that consists of about 80 species and numerous hybrids and cultivars. It is great prized in the horticulture trade for its flowers that are captivating, long-lasting, extremely colourful and some even scented. In their native habitat, the plants are epiphytic and cling to tree bark with almost soilless media or in the crevasse of cliffs. 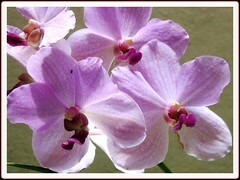 Vanda Orchid has a good root system, growing from thick fleshy bulbs that store moisture and energy for its growth. Its aerial roots help it to attach to its medium. Plants can be miniature in size or grow to about a metre or more in height. The evergreen bright green leaves are thick and has a glossy sheen. It produces various leaf shapes, some are strap-leaved, terete or semi-terete.It produces large eye-catchy flowers that open sequentially, lasting many days on thick flowered stems. 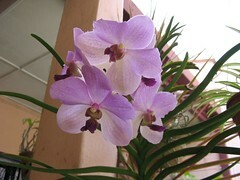 Vanda Orchids bloom intermittently throughout the year. The colourful blooms are variable in size, between 4-10 cm. Vanda orchids come in a wide range of colours, including purple, red, burgundy, white, orange, yellow and blue, and beautifully designed, some with stunning spotted petals and are heavily scented. 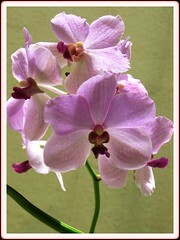 Culture (Care): Vanda Orchids grow easily with least maintenance if you can mimic the conditions of it natural habitat. Light: Best in bright sunlight or semi-shade to full shade. Avoid full sun that may scorch the foliage. Moisture: Moderate water needs. Water regularly for optimum growth. Avoid sogginess that may cause root rot. Soil: Best in a mixture of pieces of charcoal, broken bricks, coconut husk fiber. Others: For an indoor plant, use a humidifier if necessary as it benefits if provided with sufficient humidity. Feed during the growing season with a balanced fertiliser or organic-enriched flowering fertiliser. Best to feed them once weekly or fortnightly as they are heavy feeders. They dislike disturbance or damage to their root system which may result in them failing to flower. Generally free from serious garden pests and diseases. For subtropical and temperate regions: Hardiness: USDA Zone 10-11. 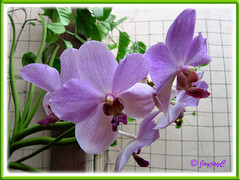 Vanda Orchid plant is a warm climate plant, requiring temperatures between 13°C and 35°C. It has no cold tolerance. Repot the plants every three to five years in spring. Can be grown in the green house. Propagation: Best by stem cuttings. Learn how-to here. 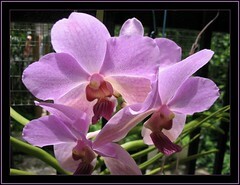 Usage: Vanda Orchids are excellent ornamental plant, located outdoors or indoors. It is a favourite with hybridists who work tirelessly to produce flowers for the cut flower market. It produces long-lasting flowers that last for several weeks, hence great for your home decor. Most ideal for container planting in hanging pots or baskets. Dendrobium phalaenopsis, a year-round bloomer! Cattleya orchids: exotic species and hybrids!